The run up to today’s Apple event brought with it a lot of “will they, won’t they” type of discussions. Analysts and industry experts have been debating the future of Apple furiously, focusing on what would be introduced during this extremely important event. At one point there was even mention of the possibility of Apple doing away with the iPad mini to focus on its larger tablets. 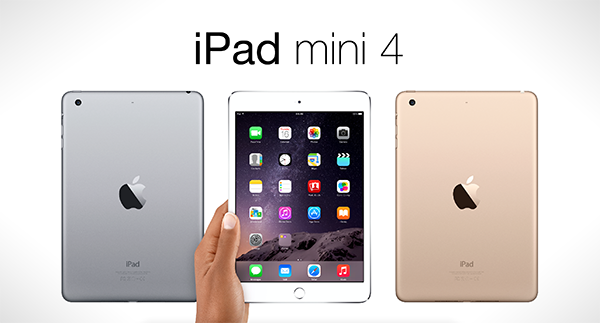 Well, now that the iPad mini 4 is officially here we can lay the rumour to rest. Here’s the full lowdown on the fourth-generation miniature iPad. Finally, the ‘mini’ tablet from Apple is truly, mini, so let’s not waste anymore time and get down to the specifics of the iPad mini 4. As expected, Apple and its relevant design teams have taken inspiration from the beautiful iPad Air 2 to produce the fourth-generation iPad mini. The ultra-sleek form factor of the current flagship iPad Air has been ported across to the latest mini offering, bringing with it a stunning 6.1 mm profile, compared to the 7.5 mm slab that is the iPad mini 3. If it isn’t broke then it’s probably wise to leave it well and truly alone. To that effect, the iPad mini 4 features the same 7.9-inch stunning Retina display that made visual media on the third-generation iPad mini look sensational. The native 2048 x 1536 pixel resolution produces a whopping 3.1 million pixels, equating to 326 pixels-per-inch. But that’s not all; the display technology on the mini 4 seems to have been borrowed from the iPad Air 2, in what are essentially three display components combined into one panel, to create life-like images. The latest iPad mini benefits from the inclusion of the Apple-designed A8 processor and M8 motion coprocessor, found in last year’s iPhone 6 and 6 Plus. The 64-bit architecture of the A8 chip offers up incredibly fast CPU speeds, coupled together with seriously impressive graphics that makes the iPad mini 4 a significant improvement over its predecessor. Apple’s range of iPads aren’t exactly known for being the easiest to use when it comes to capturing those impromptu photographs. After all, that’s not really the intended purpose of 7.9-inch tablet. With that said, the company continues to improve the camera offerings with each generational bump, this time around offering an 8-megapixel rear shooter with a forward-facing 1.2-megapixel module for FaceTime HD cam. 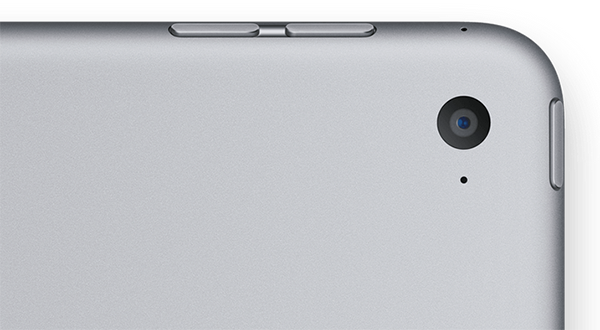 The primary camera can supports video stabilization, ability to record 1080p videos as well as Slo-mo videos at 120fps. Continuous improvements have already been made, and will continue to be made to Touch ID. There isn’t really a great deal that can be done hardware wise to improve the functionality as the reader is already extremely efficient. The latest and greatest iPad mini features the same Touch ID sensor as found in the iPad mini 3 with any amendments to the functionality being handled software side. Battery life is an extremely important aspect on any consumer device, but even more so when we’re talking about a portable tablet like the iPad. The integrated lithium-ion battery that’s built into the iPad mini 4 provide users with up to ten hours of continuous battery life under perfect conditions. One of the biggest selling points of the new iPad mini is the fact that it will ship with a fully functional version of iOS 9 already installed. 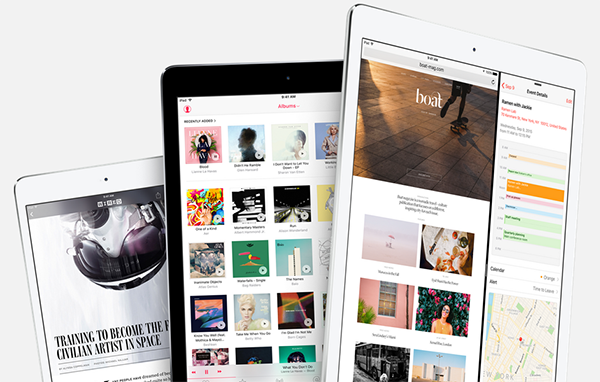 Apple has gone to seemingly impressive lengths to develop iOS 9 with the iPad firmly in its mind, something that immediately shows when you consider the iPad-only-features embedded within. The inclusion of the new Slide Over and Split View functionality that belongs to the iPad will increase productivity and multitasking capabilities. Don’t forget, there’s also the new Picture-in-Picture (PiP) that has caused a stir with excited iOS fans ever since it was initially introduced by Apple during WWDC. Nothing new to report here, unfortunately. The iPad mini may have benefited from a beautiful revamp, but the color options are remaining the same. Interested consumers will be able to mull over the choice of having the fourth-generation iPad with a Space Gray, Silver, or beautiful Gold finish. Sometimes it’s the availability of marketable and powerful accessories that can end up convincing a consumer to purchase a product. To compliment the latest iPad mini 4 Apple has revamped the accompanying accessory range by filings it physical and digital shelves up with new Smart Covers in a range of finishes, as well as a stunning Smart Case that offers a next level of protection. iPad mini 4 is currently available for purchase on the online Apple Store, and is shipping in about 4-6 business days. They should’ve done this on iPad mini 3. And make less money? Apple are a sneaky bunch. So does the software amendments to Touch ID imply it is the 2nd version or is that restricted to the Pro?